Flying is freedom – the freedom to go where you want, when you want. How does flying up to Lake Tahoe to go skiing sound? A weekend in Las Vegas without the hassle of the airlines? Lunch with friends in Palm Springs? A flight to Catalina for a world-famous Buffalo Burger? A romantic dinner in San Diego? Or just jumping in the plane and flying simply for the fun of being aloft? These are just a few of the countless adventures waiting to be discovered for any pilot flying in Southern California. Primary flight training in single-engine aircraft is the first step that most pilots make. If you want to fly for fun or fly for a living, this is where it all starts. Early in your training we will match you to the instructor best suited to your style of learning. Your instructor will work with you to accommodate your schedule and will give you feedback and encouragement as you progress toward becoming a licensed pilot. Learning to fly is a process that requires some dedication. Ideally, students should take a lesson twice a week, three times if possible. This keeps your skills sharp and prevents you from having to relearn things that you’ll end up forgetting if your lessons are spaced too far apart. Put simply – regular lessons keep the costs down as most students will need less time to learn. But if you need to interrupt your training for whatever reason, it will only take a few refresher lessons to regain your proficiency. While it is difficult to give a concrete estimate (everyone learns at a different pace), a typical student will invest around $12,000 to $15,000 on flight training to earn a private pilot certificate. This is a significant sum for sure, but well worth it for the lifetime of freedom and adventure that awaits. We have had exceptional students finish training in as little as 55 hours, but the vast majority of our students are ready at around 70 hours. The Minimum hours of training required by the FAA is 40, but this rule was made more than fifty years ago – flying is a lot more sophisticated now. As you research different flight schools you will more than likely see a huge range of prices being quoted – many of them well under $10,000. These low cost quotes are nearly always based on the student being ready for the check ride within the minimum hours required. We prefer to give you a realistic number based on the average training hours of students in the U.S.
To be a certificated private pilot, you need to fly with an instructor as well as solo later in your training for a number of hours set by the FAA. There is also a written exam and a practical test with an examiner known as a check ride. Below are the minimum training requirements – it is worth noting that these training minimums were put in place a long time ago, when training aircraft and the airspace they flew in were very simple compared to today. The minimum hours of training before you can take the check ride for your license is 40 hours. The national average time for students to be ready is around 70. Most of our students fall within this range, but a few may take a little longer – everyone learns at a different pace, and we fly in a complex airspace. As you research your flight training options you will encounter numerous acronyms and terms that may not be familiar; please visit the glossary of common flight training terminology to educate yourself on them. A first class is required for pilots flying scheduled airliners and other pilots whose employers require this level of certification. Second class is required for pilots who fly commercially—in operations such as crop dusting, delivering canceled checks, or carrying passengers or cargo for hire. Third class is for student pilots and private pilots who fly for pleasure or personal business. Student pilots need only a third class/student pilot certificate which is a combination certificate, and serves both as a pilot and medical certificate. The actual exam is with an aviation medical examiner and is nothing more than a basic physical to make sure you are fit to fly. Most aviation medical examiners are pilots too, which makes the whole process much more fun than your usual doctor visit. You do not need perfect 20/20 vision – if you wear glasses or contact lenses this is generally not an issue. Please talk to an instructor before you make your appointment with an A.M.E – there are specific things you need to ask the A.M.E for. Click the link below to find an aviation medical examiner near you. The more often you take lessons, the less time it will take before you are ready for the check ride. Below is a rough guide to show that the more often you fly, the sooner you will be a certified pilot. The First Lesson introduces you to the process of learning to fly. You will learn to pre-flight the airplane, taxi to the runway, and make your first take-off with help from your instructor. As you climb out you’ll see jets taking off from LAX on the left, and the Santa Monica pier below. You’ll fly over the Malibu coast, where you will work on developing your basic flying skills, then its back to land at Santa Monica. The Extended First Lesson is our most fun introductory flight. You will learn to pre-flight the airplane, taxi to the runway, and make your first take-off with help from your instructor. 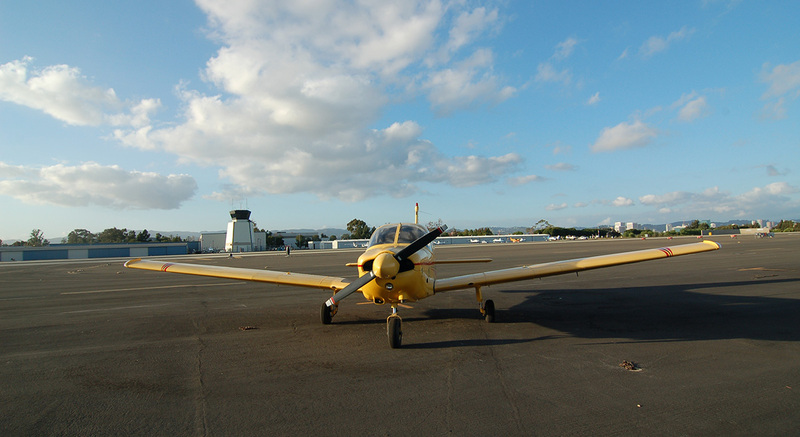 You’ll fly up the Malibu coastline and over to land at the historic and bustling Van Nuys airport. Van Nuys is home to vintage and modern warbirds, firefighting helicopters, and huge private jets. Then its time to depart Van Nuys, fly by the Getty Centre, and land back at Santa Monica. An unforgettable flying lesson, guaranteed! Learn to fly in Cirrus aircraft – the top selling personal airplane worldwide for more than a decade. Cirrus aircraft offer advanced technological innovation, exhilarating performance, exceptional safety features such as the CAPS full-frame parachute system, and unprecedented style. The CAPS parachute system unique to Cirrus is designed to protect occupants in the event of an emergency by lowering the aircraft to the ground after deployment. CAPS revolutionized general aviation safety by providing an additional measure of safety to occupants, similar in theory to the role of seatbelts in automobiles. No other certified general aviation aircraft manufacturer in the world provides this safety feature as standard equipment. Other safety features include an integrated fuselage roll cage, Cirrus Energy Absorbing Technology (CEAT™) seats, and AmSafe airbags for Pilot and Co-Pilot. 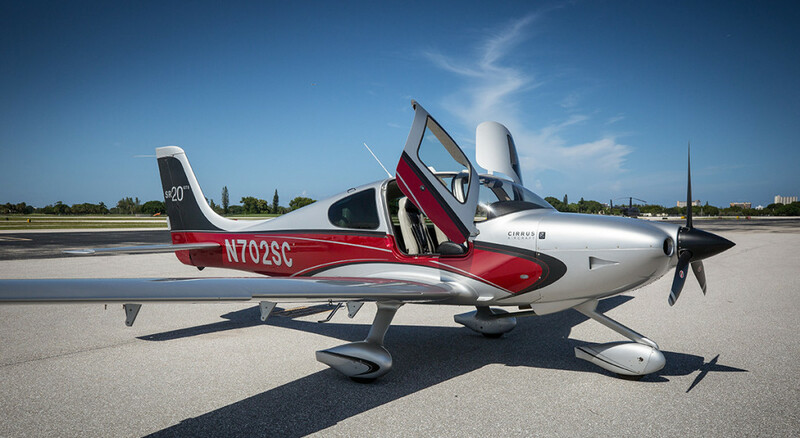 Cirrus aircraft are roomy and comfortable with wide opening doors, high volume cabin, side control stick, luxury leather seating, and air conditioning. They are equipped with new-generation avionics that combine computers and modern navigational aids for both system redundancy and to improve pilot situational awareness. Pilots often refer to the panel as a glass cockpit – the large screens used for instrument display are a marked improvement over legacy avionics panels. Proteus is a Cirrus Aircraft factory authorized training center. We provide highly standardized training, supported by industry-leading tools such as the Cirrus Online Learning Portal. Early in your training we will match you to the instructor best suited to your style of learning. We encourage students to fly with a few different instructors early in the training – it’s important to us that you ‘click’ with your instructor. Your instructor will work with you to accommodate your schedule and will give you feedback and encouragement as you progress toward becoming a licensed pilot. Learning to fly is a process that requires some dedication. Ideally, you should take a lesson twice a week, three times if possible. This keeps your skills sharp and prevents you from having to relearn things that you’ll end up forgetting if your lessons are spaced too far apart. Put simply – regular lessons keep the costs down as most students will need less time to learn. But if you need to interrupt your training for whatever reason, it will only take a few refresher lessons to regain your proficiency. Enjoy your first flying lesson in a Cirrus SR20 with Avidyne Entegra avionics. You will learn to pre-flight the airplane, taxi to the runway, and make your first take-off with help from your instructor. As you climb out you’ll see jets taking off from LAX on the left, and the Santa Monica pier below. 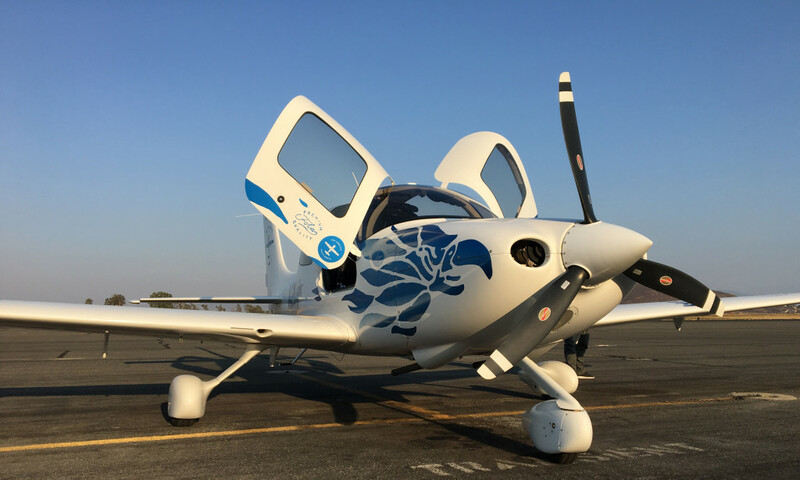 You’ll fly over the Malibu coast up to Point Dume, where you will work on developing your basic flying skills, then its back to land at Santa Monica via Pacific Palisades. Includes a free logbook to record your flight in. Upgrade your first flying lesson to a Cirrus SR20 GTS with Garmin Perspective avionics, air conditioning for comfort, and many more features. You will learn to pre-flight the airplane, taxi to the runway, and make your first take-off with help from your instructor. You’ll fly up the Malibu coastline and over to land at the historic and bustling Van Nuys airport. Van Nuys is home to vintage and modern warbirds, firefighting helicopters, and huge private jets. Then its time to depart Van Nuys, fly by the Getty Centre, and land back at Santa Monica. An unforgettable flying lesson, guaranteed! Includes a free logbook to record your flight in.